Every winter, a young girl flies to Haiti to visit her Auntie Luce, a painter. The moment she steps off the plane, she feels a wall of heat, and familiar sights soon follow -- the boys selling water ice by the pink cathedral, the tap tap buses in the busy streets, the fog and steep winding road to her aunt's home in the mountains. 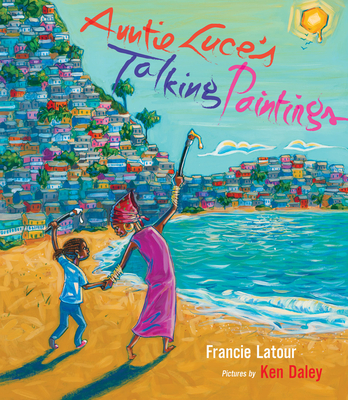 The girl has always loved Auntie Luce's paintings -- the houses tucked into the hillside, colorful fishing boats by the water, heroes who fought for and won the country's independence. Through Haiti's colors, the girl comes to understand this place her family calls home. And when the moment finally comes to have her own portrait painted for the first time, she begins to see herself in a new way, tracing her own history and identity through her aunt's brush. Includes an author's note and a glossary.